www.HoffySwims.com: "Warm Up" for the World Winter Swimming Championships at Tooting Bec Lido, London, my coldest ever swim! "Warm Up" for the World Winter Swimming Championships at Tooting Bec Lido, London, my coldest ever swim! Above: Tooting Bec Lido, London, the largest fresh water swimming pool in England (90 Metres long), home of the South London Swimming Club, and to the World Cold Water Swimming Championships, February 9 - 10, 2008. Getting up at the unearthly hour of 05.30 Hours on a cold but beautifully sunny January Sunday morning to travel a 180 mile round trip to London for a 20 second swim at 6.7 degrees Centigrade (44.06 degrees Fahrenheit) is not many peoples idea of a fun day out. However, all in the name of "2 way channel swim cold water acclimatisation" today, that's exactly what we did. In two weeks time competitors from over 20 countries from around the world, will congregate in Tooting to compete in the first World Cold Water swimming championships to be held outside of Finland. Today, we were asked to compete in a trial of the first 8 events so that the organisers could practice for the big day, as well as the competitors acclimatising to the water. We all checked in, and I was given a race card to hang around my neck, which said I was now "Paivikki Filpus" (Female!) competing in race number 4, Lane 5, start time 09.19. (I'd never been an actor before! - Little Britain's "I'm a Lady" sprung to mind). About Cold Water Swimming (From the World Championships website). 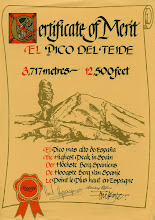 "Aficionados of cold water swimming claim it gives them the ultimate high, making them feel invigorated, even euphoric. Swimming in the depths of winter is popular in Russia, China and Scandinavia - Finland has held the Winter Swimming Championships for several years. Finnish competitions attract thousands of entrants who willingly plunge into pools carved from the ice, while the air temperature plummets to as low as minus 45C. While it may not be quite so cold in south London the water will still feel pretty chilly at an average of 4C. Despite the freezing temperatures, the rules of cold water swimming dictate that competitors can only wear normal costume or trunks, along with a hat and goggles. For the main races the standard stroke is ‘head up breaststroke’, introduced by the organisers of the Finnish Ice Swimming Championships as a way of levelling the field between elite pool swimmers and hardy ice swimmers. It also has the benefit of retaining more heat in the body and has now become the preferred stroke for cold water swimming competitions. Converts to cold water swimming insist the practice has real health benefits. While these are still subject to medical debate, habitual winter swimmers say it boosts the immune system, circulation and even libido. Certainly, Lido regulars do not seem to suffer any more colds and flu than the rest of the population and they all agree that cold water swimming gives them an unbeatable feel-good factor. However, it is a good idea for swimmers to obtain medical advice and acclimatise to cold water before competing." Arriving at the Lido, I bumped into the actress Lucy Petrie (nee Scott), who sponsored me for my 2007 channel swim and was a regular swimmer at Dover in summer 2007. Lucy, is best known for her performance as Charlotte Lucas (the Vicar's wife) in the BBC's 1995 production of Jane Austin's "Pride and Prejudice". Lucy and her actor husband Alistair Petrie, made a two person channel relay crossing in 12 Hours 21 minutes on the same day as my channel crossing, July 10, 2007. Above: Me with Lucy Petrie, actress and successful two-person channel relay swimmer 2007. When I arrived, I put my watch into the water to test the water temperature. I was told that it get's down to 3 degrees centigrade, however, after 15 minutes in the water, it had levelled out at 6.7 degrees centigrade. I was pleased and disappointed. I had prepared myself mentally for 3 degrees, but was surprised to find it was 6.7 degrees. We were summonsed to our positions, stripped off and got into the pool. As I jumped in, it was cold, but not as cold as I had imagined. They told us to put our shoulders under the water, walk forward, grab the starting ring and wait. It was very cold, but bearable. The horn went, and off I went - 25 Metres "Head up breastroke". I, or Paivikki Filpus, came in first, but then again I should as a man in a female race, there were three other ladies and a gentleman who's name I didn't catch ("Paivikki Filpus" you won the race). As soon as I hit the end I said "Can I get out? Can I get out?". The marshall nodded and out I jumped. It was much warmer out of the water in just a pair of speedos, than it was in it. I showered, dressed and was pleased with my efforts. Above: Watch my lips - "By Jove! This is jolly cold old chap isn't it?". I'm sure that's what I said anyway! Above: Paivikki Filpus (aka me) wins Race number 4, - Ladies "Head up Breastroke". I know it's very confusing, but it was just a practice of the actual race order for the organisers. Above: "Can I get out? Can I get out?". After all, you don't want to stand around in 6.7 degrees centigrade water for long I can assure you! Having returned to poolside, I bumped into Jim Boucher. 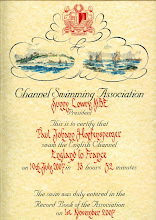 Jim swum the channel on August 11, 2007 in 15 Hours 28 minutes, and was a regular on swimmers beach, Dover during 2007. Above: Me with Channel Swimmer Jim Boucher (11-08-2007 - 15:28). Having met up with Jim, and watched him get in for a swim, I decided to get in again, and try a bit of front crawl at 6.7 degrees Centigrade. This meant obviously, putting my head and face in the water. This is undoubtedly the worst bit. It gives you a real "Ice cream headache". Just as if you've bitten into a freezing ice cream, only it just doesn't give up, it get's worse the longer you are in there. I managed about 100 Metres, then got out. Above: My first attempt at 100 Metres Freestyle at 6.7 degrees centigrade (44.06 degrees Fahrenheit). I like your "ice cream" head ache description. Bet it hurt though. I don't know how you do it. Hi Ruby - Yes it's a fantastic facility. I love it there. It's huge. I bet it's great in the summer but have only swum there in March and now January. I can still feel that "Ice Cream" headache today and I've been in the sauna at Clarice House for 2 hours! LOL! See you Friday (I will e-mail you tomorrow - been busy today). "Every great adventure begins with the first step..."
Last updated: February 08, 2019. Bury St Edmunds, Suffolk, UK. I have been a swimmer since the age of 4 years old, representing my Town (Bury St Edmunds), County (Suffolk)and Country (England). I was the County record holder for 14/15 years old 100 Metres freestyle, county champion for 14/15 years old 100 Metres Backstroke, and Suffolk Champion for 100 Metres freestyle in 1983. 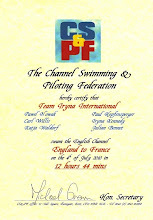 In the summer of 2006 I decided to take up Masters and open water swimming as part of an attempt to swim the English Channel. 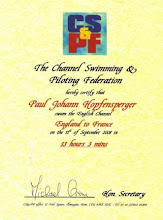 On July 10, 2007 I achieved this and became the 873rd person in history to swim the English Channel. 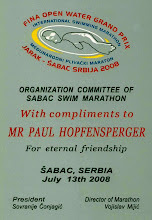 On September 11-12, 2008 I repeated this feat and became only th 84th person in history to swim it twice. 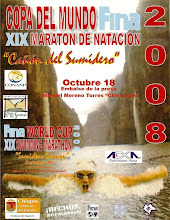 Also in 2008 I completed another lifetime goal of representing my country when I competed in two FINA World Cup Open Water Grand Prix in Serbia and Mexico respectively. (c) Copyright Paul Hopfensperger 2006-2019. All rights reserved. 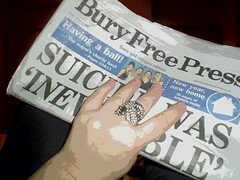 No part of this website may be used or reproduced without the written permission of Paul Hopfensperger, c/o Body and Mind Studio Limited, The Wellness Centre, 16 Risbygate Street, Bury St Edmunds, Suffolk, IP33 3AA, United Kingdom. 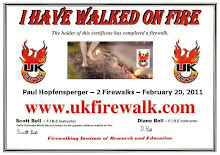 All content is provided for information only and, while Paul Hopfensperger takes reasonable efforts to ensure its accuracy, he cannot guarantee it. Paul Hopfensperger, is not an expert provider of medical advice. You, the reader, are advised to seek professional medical advice before swimming if you have any injuries or medical conditions. Open water swimming does involve a level of risk and you are advised to take appropriate precautions.